Sidney Bolam has always been fascinated by stone. The local carver works in Indiana limestone and focuses on relief carvings. Very appropriate, given she lives between Nashville and Bloomington, Indiana. “Southern Indiana has some of the finest stone for carving in the world,” Sidney explains. Many of Sidney’s pieces are inspired by historical stone carvings. “I am inspired by our ancestors,” she says. Sidney studied fine arts, anthropology and art history at Indiana University, all of which influence her carvings. “I studied medieval architecture a bit while in school,” Sidney adds. 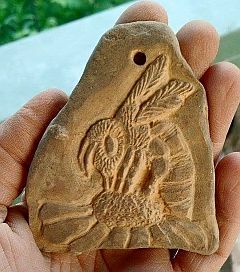 But, in addition, her life in the woods of Brown County, plus her work with a local Raptor Center, has inspired her to explore nature in her carvings, including birds and owls, as well as foliate heads, called Greenmen. “I was never meant to actually live in a city, no matter how small!” says Sidney. “Brown County with its parks, trees, hills, wildlife and art community seems magically made for a person like me.” That art community has benefited Sidney’s work. Her teacher and mentor is James Connor, a local stone and metal artist. “He helped me learn about stone carving techniques and helped me gain a general confidence for problem solving,” says Sidney. Sidney works out of Bohemian Hobbit Studio, at her home. Since her work time is at the mercy of her family's schedule, some days of the week she might sit in her outdoor studio carving for hours, while other days are so busy she can only work an hour here or there, or in the wee hours of the night with only her German shepherd for company. 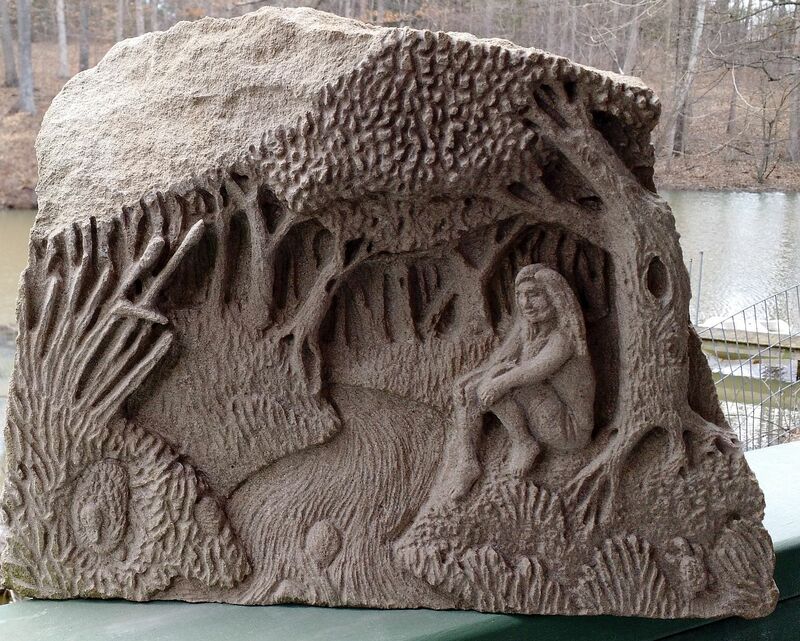 “Every few months I spend a day at the quarry,” Sidney says, “collecting stones and imagining new projects.” While many stone carvers do large permanent works that would be unattainable to the individual art collector, the largest of Sidney’s carvings can be picked up and moved by a person or two, making them perfect for homes and gardens. “My style of rendering is unique,” says Sidney, “and influenced from my time as a painter and illustrator.” Besides her limestone relief sculptures, Sidney also carves small sculptures and pendants out of soapstone and chlorite. Sometimes, she can be found carving these small pieces while she sells her work at The Fair of the Arts in Bloomington. Sidney also plans on demonstrating her carving during the Back Roads of Brown County Studio Tour this year at her studio. More information about Sidney and her work can be found at BohemianHobbitStudio.com or at Brown County Studio Tour's website.